Whew, what a ride this week!…. Monday…..off to school to notify them I’m not returning to work for another 6 months minimum; washing; folding; packing suitcase with son for his trip 10 day holiday to Canada; contacting local university to sort out subject choices for said son (yep, he got into a double law/psychology degree); catching up with a friend for coffee; catching up with bloggy emails;cleaning; cooking dinner; sending parcels to bloggy friends; getting the mail; getting schoolwork organised for teaching stand-in; numerous phone calls, some stitching in the evening just to regain sanity! Tuesday…..off to Townsville (an hour’s drive away) for a car service…..most of the day spent waiting…..waiting…..waiting……and more waiting… some more stitching in the evening just to maintain sanity! 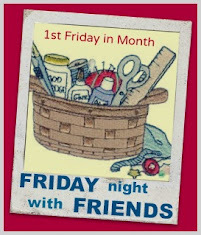 Thursday…..school again; monitored the phone for text message saying son was boarding plane; professional development till 1.15; back to classroom to pack some more; bought cockroach ‘bomb’ to make school storeroom safe to store my 20-odd boxes; wheeled 5 full wheely (garbage) bins out of my classroom; went shopping for essentials – cat food, dog food, fruit, milk, loo paper (yep, that’s what it’s doing to me! ); home at 7pm to heat leftovers for dinner; wash dishes; shower, blog and about to go to bed!….really needing sanity stitching!!!!! And I wonder where the days go sometimes??!!!! Do you have that same problem???? Anyway, being without my sanity leveller is just sooo not healthy, so tomorrow night I’ve locked in my very first Friday Night Sew In. Details are on my sidebar if you haven’t heard of it before……will you come and join me???? I thought I might even tie my stitching into this…..
and kill two birds with one stone, so to speak! I think tomorrow night will be just the thing to wind down after a whirlwind of a week…..and gather my equilibrium………whaddya think? Sounds like you really need to put your feet up now! LOL! Like Fiona, just reading that made me yawn (really!!)!! Such a busy, busy woman!! ... Enjoy your extra 6 months off! I think you deserve a well earned break after just this week let alone the other weeks you didn't tell us about which I'm sure have been just as busy,enjoy Friday night and just RELAX!! :) Barb. lol. My first reaction was - hey, dont forget to take a breath. Seems others had the same feeling. You have been run giddy for the first days of the week. All the best to your son as he heads off on this adventure, and to you too. Luckily you have the sanity thing at night happening or where would you be?